We recommend checking out our discussion threads on the Tenba Messenger Series: Photo/Laptop Daypack (Olive) 638-292, which address similar problems with connecting and setting up Backpacks & Sling Bags Tenba. The user manual for the Tenba Messenger Series: Photo/Laptop Daypack (Olive) 638-292 provides necessary instructions for the proper use of the product Photography - Bags & Cases - Backpacks & Sling Bags. 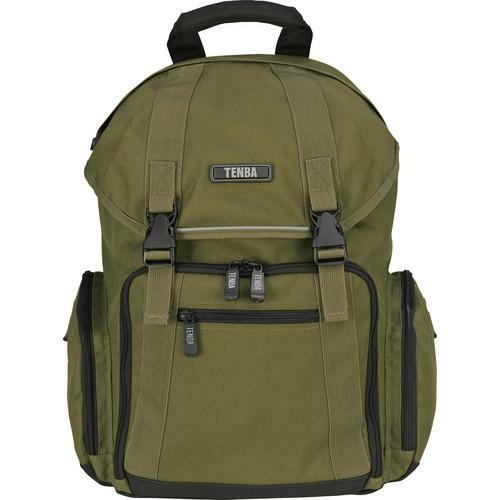 The Tenba Messenger Series: Photo/Laptop Daypack (Olive) is a lightweight backpack/daypack with a removable photo insert designed to carry a SLR camera with 2-3 lenses, flash, accessories, magazines and files. A laptop compartment will hold a computer with a screen up to 15" or an Apple MacBook pro notebook computer. The bag is made from weather and abrasion resistant 1000 denier military-grade nylon with closed-cell, crossed-link foam padded interior. A "wide mouth" top drawstring opening accesses the padded laptop compartment and a flexible storage space. There is a tilt-out front panel with a removable, adjustable photo insert that offers fast, quick-draw access to an SLR camera 2-3 lens kit. There is a full overlap top flap that provides weather protection and security. Dual, military-grade web straps provide additional security to both top flap and front photo section. The Photo/Laptop Daypack has 30 various pockets, slots and storage spaces, including large side cargo pockets that hold cables, media cards and much more, an organizer inside the top flap keeps portable devices and accessories quickly accessible plus an accessory organizer in the top section holds a hard drive, USB thumb drives and more. There is additional fast storage and easy access to small items in the front zip pocket. Color-coded media windows separate used flash cards from empty ones. The pack can be carried by a padded handle or an expedition-grade harness system that is lined with ventilated mesh for serious carrying comfort. If you own a Tenba backpacks & sling bags and have a user manual in electronic form, you can upload it to this website using the link on the right side of the screen. Box Dimensions (LxWxH) 18.9 x 13.7 x 6.9"
The user manual for the Tenba Messenger Series: Photo/Laptop Daypack (Olive) 638-292 can be downloaded in .pdf format if it did not come with your new backpacks & sling bags, although the seller is required to supply one. It is also quite common that customers throw out the user manual with the box, or put the CD away somewhere and then can’t find it. That’s why we and other Tenba users keep a unique electronic library for Tenba backpacks & sling bagss, where you can use our link to download the user manual for the Tenba Messenger Series: Photo/Laptop Daypack (Olive) 638-292. The user manual lists all of the functions of the Tenba Messenger Series: Photo/Laptop Daypack (Olive) 638-292, all the basic and advanced features and tells you how to use the backpacks & sling bags. The manual also provides troubleshooting for common problems. Even greater detail is provided by the service manual, which is not typically shipped with the product, but which can often be downloaded from Tenba service. If you want to help expand our database, you can upload a link to this website to download a user manual or service manual, ideally in .pdf format. These pages are created by you – users of the Tenba Messenger Series: Photo/Laptop Daypack (Olive) 638-292. User manuals are also available on the Tenba website under Photography - Bags & Cases - Backpacks & Sling Bags.